This is tarako on pasta. One of my prefered pasta dish. You should really try it. The bad is fluo red as it contains a preservative product that would be bad for you. But you can get those and mix them with industrial mayonnaise to obtain that abominable tarama spread to lay generously on buttered/margarined slices of industrial bread. Yep, you’ll get those fluo pink canapes that would make you gag in the parties during the 70’s and gave such a bad rap to Greek cuisine, even if I am pretty sure that nobody Greek or of any other human origine was producing our supermarket’s spread. It came from another galaxy. And my fishmonger had eggs of codfish. The authentic tarako. So I got some. Cod fish roe that I rinsed, salted and kept 2 days in fridge. When you buy it, it stinks. After curing, it smells. After rinsing and seasoning with alcohol, it smells good. Yeah ! This is an Okinawan condiment made of awamori with Okinawan hot chili peppers. Awamori is a sake made of sticky rice. I rinsed the salted roe and seasoned with the chili-awamori and a little paprika powder. It’s really tasty and much less salty than the commercial version. Of course I can’t store it, but why would I ? Mentaiko spaghetti, tarako spag’… that’s a popular pasta dish in Japan. So easy to prepare. Put cured mentaiko/tarako on very hot pasta, with butter…and mix. The pasta will cook the fish roe. Well… unless you lose precious time taking photos for a blog, but 10 seconds in micro-wave saved the dish. They often top it with ribbons of nori seaweed. Today I prefered negi leeks and dill. Steamed veggies, including kakinoki-take (persimmon tree mushrooms). Seasoning was simply black rice vinegar. Posted on January 27, 2011 by My	• This entry was posted in (quick) 5 minutes active cooking, Avec la recette, Home-made Fait-Maison, Ingredients, Japan/ cuisine japonaise, Shopping, With recipe and tagged awamori, brunch, butter, cabillaud, cod, cod fish, cuisine japonaise, dill, fish eggs, fish roe, hot chili, Japan, Japanese, kakinokitake, mentaiko, mushrooms, negi leeks, nori, Okinawa, Okinawan awamori-chili sauce, pasta, roe, sea food pasta, seafood, side-dish, tara, tarako, tarama. Bookmark the permalink. The colors are outstanding … I could eat up that roe on its own. 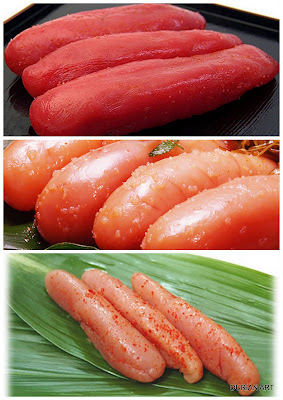 I’ve developed a taste for fish roe, but hubby hasn’t so I don’t eat it as often as I would like. This dish is elegant and looks delicious.